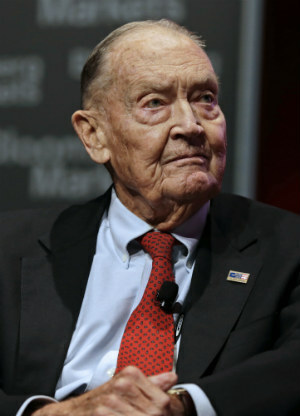 Jack Bogle sadly passed away in January 2019 at the age of 89. With his most recognised invention - the low-cost index tracker fund - he arguably did more to help average investors than any other person by realizing that instead of trying to beat the market, you'll do very well by matching the market and stripping out the costs. The company he founded, Vanguard group, is the world's largest mutual fund company (with around $5 trillion in invested assets) and offers investors the chance to "passively" track the index whilst having some of the lowest costs in the industry. If you don't know where to begin with investing your cash then take the advice of Jack Bogle - "don't look for the needle in the haystack just buy the haystack." Jack Bogle was born in 1929 and, after his family had suffered greatly in the depression, discovered an early interest in investing and the securities markets. Bogle struggled at Princeton but was determined to go out on a high and wrote a unique thesis. His thesis studied the mutual fund industry and concluded that "future growth can be maximzed by reducing sales charges and management fees." Jack's thesis was read by Walter Morgan who was the founder of the Wellington Fund. He was so impressed by his work that he offered him a job. Bogle rose steadily through the ranks at Wellington and became executive vice president in 1965. At Wellington, Bogle suggested merging with a company called Thorndike, Doran, Paine & Lewis and Bogle became CEO of the merged company. The merger, however, proved disastrous and Wellington's stock price dropped by over 90% between 1968 and 1975. Jack Bogle was fired by the board. This mistake convinced Bogle that, instead of trying to beat the market, he should just try to match it. He vowed to create a managed fund that simply tracked the market as a whole and lowered fees. He founded Vanguard group in 1974 (it was named after HMS Vanguard, the ship of Britain's legendary Admiral Nelson) and created the first index mutual fund available to the public in 1976. At first, Wall street did not view him as much of a threat but today around 25% of invested cash is in passive funds in the US. It is becoming harder for fund managers to justify their existence, charging fees which are 10-20 times higher. Bogle suffered heart problems throughout his life. He had his first heart attack aged 31 and suffered from at least five more. Due to this, he stepped down as Vanguard CEO in 1996 and had a heart transplant that same year. He tried returning to Vanguard but stood down for good in 1999. Bogle has written several books and has been a regular speaker and media contributor since he retired from Vanguard group. 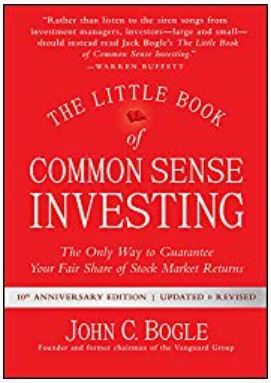 His most famous book and one we definitely recommend you read is "The Little Book Of Common Sense Investing" written in 2007. How can Jack Bogle help you? Jack Bogle thought the entire mutual fund industry was ripping its clients off with its high fees and high costs. He made it his life's mission to help the regular investor. 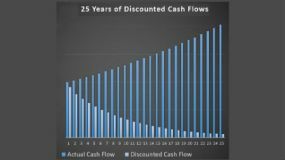 His theory was that if stock prices appreciated 4% per year and dividends paid you 2% per year, then your 6% total return would be eaten up by average inflation of 2% and costs of 2%. In this scenario, investors were giving up half their real gains to mutual fund managers. Remember how important having small charges is. 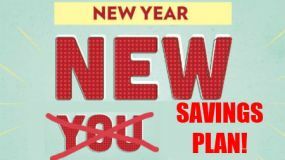 For example, if you started with $25,000 at the age of 25 and added $10,000 to your account every year for 40 years and earned 7% per year then you would have $590,000 less if you were charged just 1%. To read more about the effect of small percentage changes on your returns then have a look at our page on compound interest. Bogle was determined to make investing as simple and cost effective as possible for the average investor. He realized that Wall Street was pocketing far too much of people's money in the form of charges and that they were coming up with ever more complex products that served the investor no better than the market as a whole. He also knew that the returns of the entire market were a zero sum game; if one investor outperformed the market by 2% then another must underperform by the same amount. After you pay the charges then, as an entire group, mutual fund managers will underperform the market. In other word, you're more likely to overperform as underperform the market when you use a mutual fund and have to pay the fees. By contrast, the majority of Vanguard index trackers charge total fees of 0.1% or lower. They are also highly tax efficient. 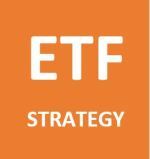 Two of the more common trackers from Vanguard are the Total Stock Market ETF (VTI) which tracked all stocks in the US (large, mid, and small) and the Vanguard S&P 500 ETF (VOO) that tracks the S&P 500. There are numerous trackers out there, though, that cover different sized company indexes, different geographies (there's even a world index fund), and different sectors. Bogle felt that if the average investor just used these trackers and didn't concern him or herself with short term fluctuations in the market and kept compounding then they will do just fine. Another key part of Jack Bogle's philosophy was not to attempt to time entries into and exits from market. Instead, you should simply be very patient. Like Warren Buffett, Bogle's favorite holding period was forever. One of Bogle's most famous sayings was "don't just do something, stand there". Index funds aren't just created for the investor looking for cheap funds. They also help people who find picking stocks too difficult, too time consuming, or too complex. 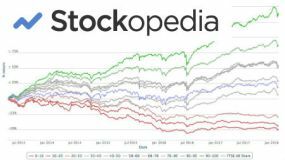 Index trackers give you instant diversification (as they effectively own all the underlying stocks in the index) and save you from doing your own research. They are an excellent option for the amateur investor. Bogle even noted in his book that Ben Graham was a fan of the idea of index tracking but these types of products weren't around in his day. Bogle did not build enormous wealth (he was "only" worth around $80 million in 2012) as he structured Vanguard as a cooperative. He also gave away much of his wealth through philanthropy. His greatest gift, though, was to investors all around the world who are now able to invest in low cost indexes across the world and keep the returns themselves rather than hand them over to overpaid mutual fund managers. To find out more about the great man then read Jack Bogle's book "The Little Book Of Common Sense Investing". We also featured Bogle's life and the investing lessons you can learn from it in our February 2019 newsletter.